Lou had made friends with noted Wisconsin sculptor Tom Every, AKA Doctor Evermore, during his work on the Sid Boyum sculpture project. 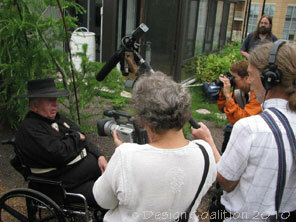 So he was a natural choice to come along on visits to the good Doctor when the Museum decided to consider commissioning a major piece for "prow" of the Roof Garden. 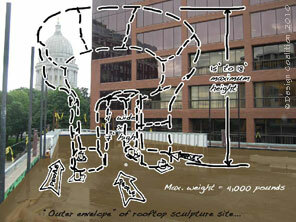 The sculptor was thrilled at the prospect of so prominent a site overlooking the State Capitol. 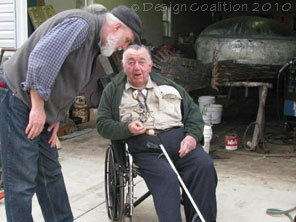 (above) Lou and Doctor Evermore chat at son Thayer's metal shop. The Doctor directed every step of the sculpture's progress from concept through welded details, and can relate the Wisconsin story behined each element, from the copper cheese-making kettle for the body to the plastics-extrusion shafts for the necks and Fiskars-blade feathers. The brief (including explanatory sketch, above) for the sculpture was necessarily specific: it needed to be child-friendly and interactive, it needed to allow wheelchair circulation in specific paths within the limited narrow space available, it couldn't extend over the building walls nor higher than eighteen feet, and it couldn't weigh more that 4,000 pounds. 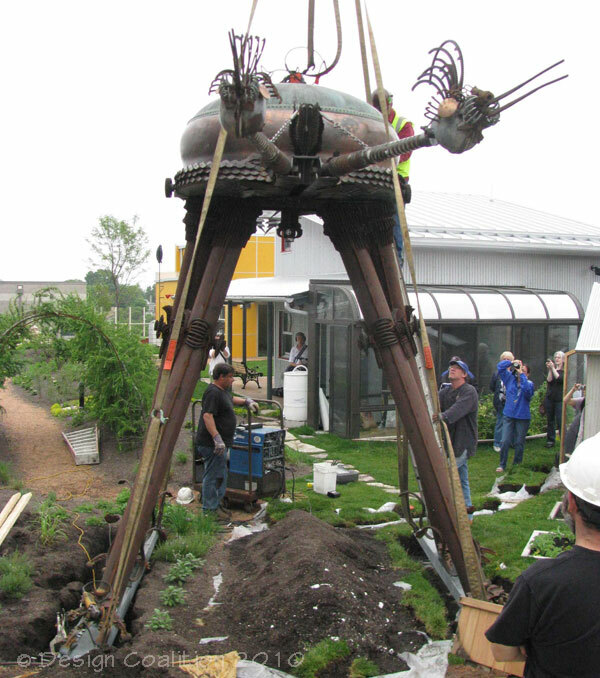 We worked with the structural engineer and roofing contractor to design and accurately place and waterproof four support stems to anchor the large sculpture. 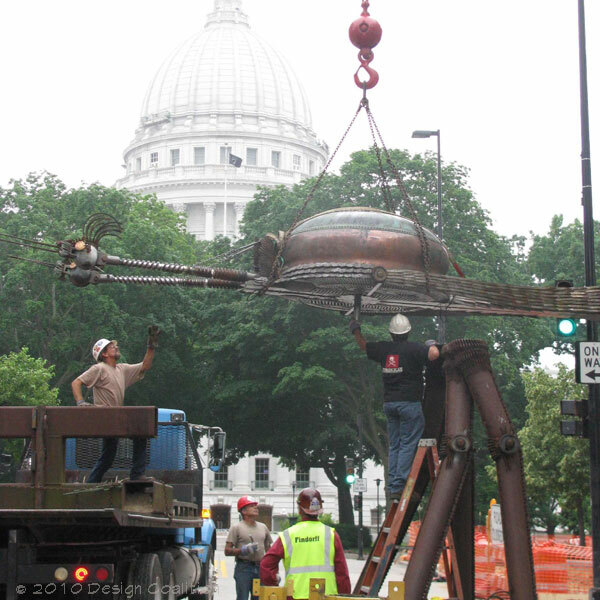 Lifting the completed sculpture into place was a highly anticipated event that closed the street for a Sunday morning -- and garnered the Museum television time as opening day approached. With little time before opening day, we learned that local utility Madison Gas & Electric would donate a sizable solar array if the Museum could devise an exhibit that could somehow illustrate the concept of solar energy to children, even though the panels were on a roof that they wouldn't be abe to see. 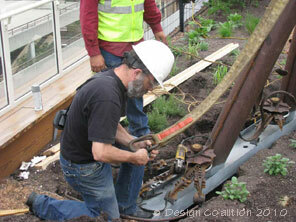 We worked with Kevin Little of Informing Ecological Design, LLC to develop his notion of a chicken laying an egg every few moments ~ this because the exhibit would be placed close by the real chicken coop on the roof. 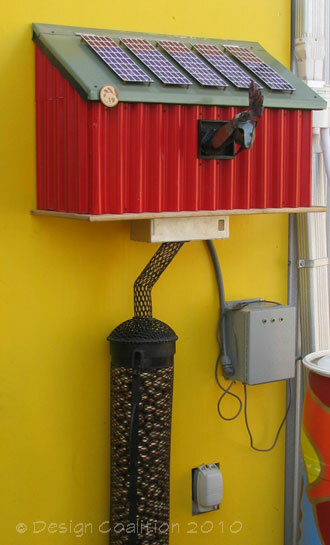 The hen sits at her coop, it's little roof filled with visible solar panels. She lays small golden eggs ~ several each minute in bright sun. The eggs roll down a tube and collect in a wire basket, over 900 on a sunny day. Kevin Little's software/hardware combo keeps an accurate count of the kilowatt-hours captured by the photovoltaic panels. (at left) Concept drawing for the Solar Chicken. Of course the Solar Chicken clucks at each egg to announce the event, thanks to internal electronics devised by artist/electrical genius Chris Murphy and his Paleo-Electronics.